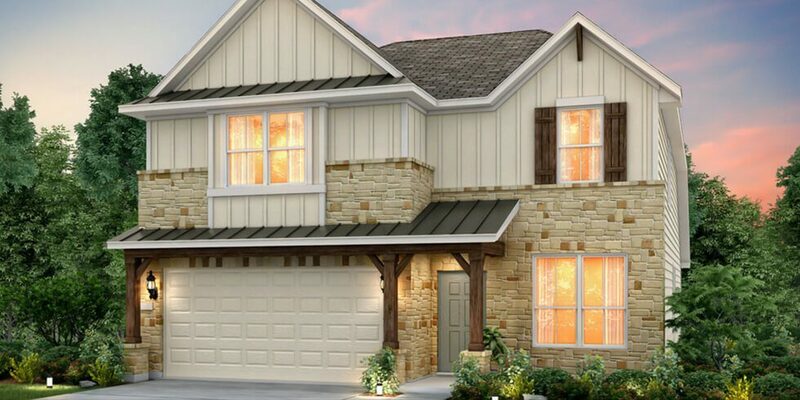 Pulte Homes is offering its smartly designed, customizable homes at Homestead, Freehold Communities’ new master-planned community in Schertz/Cibolo. Its model home opens for tours this August and showcases the beautiful Hamilton floor plan. Featuring functional spaces and luxurious features, the Hamilton is a home that was built with modern living in mind. The Hamilton floor plan is just one of the many consumer-inspired homes offered by Pulte Homes. Designed for today’s lifestyle, this two-story home features an open floor plan with a flex space that lets your home change with your needs. At approximately 2,500 square feet, the Hamilton has four bedrooms, two and a half to three bathrooms and a two-car garage. The shining jewel of the Hamilton floor plan is the decadent first-floor owner’s suite. An optional bay window is perfect for cozying up with a good book and enjoying the weather, rain or shine. The owner’s bath includes a dual vanity and his-and-hers walk-in closets, so you’ll have all the space you need for your growing collections, whether that includes beauty products, ties, shoes or all of the above. And depending on your preference, enjoy long, relaxing soaks in the oversized tub, which comes standard, or opt for an extra-large walk-in shower instead. The rest of the home is just as luxurious. The open kitchen, complete with an oversized pantry and large central island, overlooks the dining and gathering room to create a space that’s ideal for entertaining. The covered patio off of the gathering room can be extended, so whether you love to have brunch with the neighbors or just like some quiet time soaking up the sun, you can create an outdoor living space that is the perfect fit for you. The game room upstairs overlooks the gathering room below and can serve as a play room, secondary living room, personal library or just a way to keep the kids’ mess from spilling onto the main floor. Pulte Homes prides itself on creating homes that are best suited for the way you live through its Life Tested® designs. Functional living spaces, plenty of storage and smart layouts are just a few of the features that Pulte Homes includes in all of its floor plans. Part of this philosophy includes empowering homebuyers by giving them the ability to personalize their home for the way they live. Click here to see how you can customize the Hamilton floor plan, from adding an extra bathroom to deciding where your furniture could fit. The Hamilton is just one of the thoughtfully designed, customizable homes offered by Pulte Homes at Homestead. Homes range in size from approximately 1,500-2,500 square feet with three to four bedrooms and two to three bathrooms. Homes by Pulte Homes start from the low $200,000s and are situated on 55-foot homesites. The Hamilton model home from Pulte Homes opens for tours this August, so keep an eye out for details! If you’d like more information on the Hamilton floor plan, or any of the homes offered by Pulte Homes at Homestead, contact Diane Guzman at (210) 740-9725. The other homebuilders at Homestead include Scott Felder Homes and CastleRock Communities. Make sure to join our Founders Club to learn more about the homes and lifestyle at Homestead, and to always stay up-to-date on community news.